It is one of the most sought after locations on Great Ocean Road, yet it is surprisingly poorly sign posted. Wreck Beach at Moonlight Head along Great Ocean Road was (and still is) on of my favourite spots to visit along Australia’s Southern Coast. 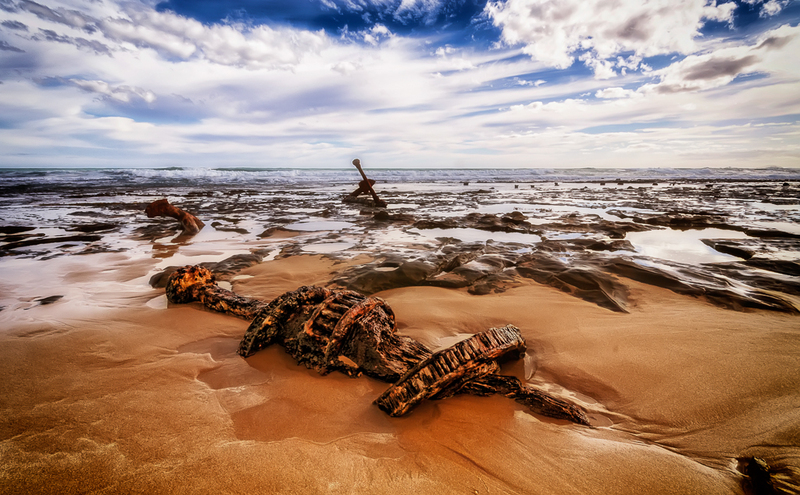 It is the site of two anchors from shipwrecks that make for amazing photographic subjects in the right conditions. When I made my first trip to the Great Ocean Road, I was hoping to come across these two. However, it took me 5 visits before I finally found where they were – and it wasn’t without a fair bit of asking before I finally located these two anchors. Access to Wreck Beach is via a walking trail from a car park which is located at the end of a gravel road that forks off Great Ocean Road at Moonlight Head. The best way to get there is by road. You do not need a 4-wheel-drive to get there. Even a small car in good repair will be able to comfortably negotiate the approach road to the car park. The car park is normally quite deserted, with ample parking for about 40 vehicles at any given time. Given that this location is poorly sign-posted from the main road, the odds are that you won’t find an awful lot of visitors here at the same time. It’s also a location that is a little off the beaten path from where tour buses typically stop, so you will not run into hordes of tourists here. The location of the anchors is about 35 minute (to the Marie-Gabrielle anchor) to 45 minute (the Fiji Anchor) hike (one way) from the car park. The hike starts along a well-marked out trail that leads down 350 metres at a mostly level gradient before meeting a cliff staircase of all of 366 stairs. The stairs are made of wood, and don’t always have railings at all its sections. They’re quite well put together and are of no concern when its dry. They can, however, become very, very slippery when its wet or when it rains. Once you’ve walked down the cliff stair case (about a 15 minute stroll from the car park), you will need to turn to your right to approach the two anchors. The walk is along the beach, along very soft sand (with a few patches of sturdy rock to walk on). The anchor of the Marie-Gabrielle is the first one that you will meet after about a 15 minute walk from the base of the staircase, encrusted in the rocks, and surrounded by a few rather deep tide pools that can be very disagreeable if you were to take a bad step. The Fiji anchor is visible from here further up the coastline, clearly seen to be standing erect at where it has come to rest. While the location is open all year round, the best time to shoot here is in the late spring through to the early autumn when the weather is warm. The cooler weather brings with it a lot of rain that can play spoil sport with any plans of capturing some good images. Like with most landscape photography, the anchors are best viewed at sunrise and sunset. However, on a day with a lot of cloud activity, you can probably pull off some good shots through till the late morning. Tides offer another perspective. The Fiji anchor is typically unaffected by tides. However, the anchor of the Marie-Gabrielle is much closer to the water line and is hence a perfect candidate for tidal effects. Consider shooting at high tide with a long exposure to get the effect of foam around the anchor. As with all outdoor locations that are a good hike, it’s a good idea to check on the weather and the tides. This part of the coast has constantly changing weather patterns, and it is not uncommon to go from bright and sunny to miserable and rainy in a matter of minutes. It is also worth checking on the times for sunrise and sunset. From the perspective of a photographer, the odds are that your camera lenses will take a beating from the sea spray. I recommend that you carry a towel and some microfiber cloth to keep your lenses clean. Tripods are essential. Your choice of lens would typically be a wide-angle lens. You will probably not shoot anything at a focal length of beyond 60mm, so I recommend leaving the zoom lens at home. If you’re planning an early morning or late evening shoot, be sure to carry a flashlight with you. The ground that you will have to cover is soft. My recommendation is to wear a pair of good, solid hiking boots. If you’re planning to shoot the Marie-Gabrielle anchor at high tide, a pair of waders are essential (unless it’s in the summer and you’re wearing sandals, and planning on going barefoot). Always dress in layers. The weather and temperature here constantly changes, and its very easy to suffer from exposure to the elements. In the summer, it is imperative that you have sunscreen on you. Last, but not least, I recommend the use of a hiking pole. Bear in mind that a visit to these anchors will take at least an hour and a half, so it’s a good idea to have some water and snacks on hand to keep you going. Vehicular Access: Gravel road to the parking lot. Pedestrian Access: Gravel pathway from the parking lot to a wooden staircase, sandy and partially rocky beach. Fitness levels required: Suitable for any reasonably fit individual. Not suitable for individuals with mobility restrictions. Amount of time required at the site: About two hours. Notes of caution: The stairs are slippery when wet, and are very steep. You might run into a snake or two in the area. Proceed with caution. Recommendations: Use a pair of hiking poles. They will make your walk along the beach much easier. A project by Debashis Talukdar. Copyright Debashis Talukdar - All Rights Reserved.